How high is Vikings’ WR Stefon Diggs’ ceiling? Rookie Stefon Diggs has only played in two games this season, but his output has impressed both his Vikings teammates and the media. 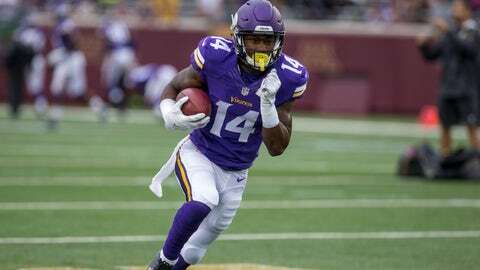 Vikings rookie wide receiver Stefon Diggs earned high praise from teammate Mike Wallace. Wallace told The Minneapolis Star-Tribune that Diggs reminds him of Steelers receiver Antonio Brown, his former teammate. The Vikings were a popular sleeper pick heading into the 2015 season, but Diggs has been the real sleeper. Drafted in the fifth round out of Maryland, Diggs wasn’t activated until the Vikings’ Week 4 game at Denver when Charles Johnson sat out with a rib injury. In two games, Diggs has caught 13 passes for 216 yards. He caught six for 87 yards in a 23-20 loss to the Broncos. Then with Johnson still out after the bye week Diggs led the Vikings with seven catches for 129 yards in a 16-10 home win over the Chiefs. The jury is still out on the Vikings. They’ve won all their home games and lost both of their road games. Even though they have a winning record, they haven’t exactly turned heads so far this season. But they’ll soon be getting some pats on the back for what’s turning out to be a fifth-round steal.